What happened at the Meridian Regional? Their was no shortage of action and excitement at the Meridian Regional. Lukas Esslinger was the fourth favorite coming into the weekend. His rope climbs were solid in Event 6, which won him his first career event win and a repeat trip to the Games for a third year in a row. Elliot Simmonds won Event 1 in 2017, and started out strong with a repeat in 2018. He also went on to win first place in Event 5. Jess Towl had a new Event 1 record with her time of 39:28. Jamie Greene’s was one of the most dominant performances in Regional history, and the weekend could not go any better for her. She sprinted down the floor first in her heat taking second place in Event 1, and then again in Event 2 and 5. And took first place in Event 3, 4 and 6. No-one could catch Greene this weekend. It was all about the race for second, third and fourth. Rasmus Andersen proved that big guys can do gymnastics as well, taking out Event 3. And kept proving his overall strength over the weekend which won him the top spot on the podium. 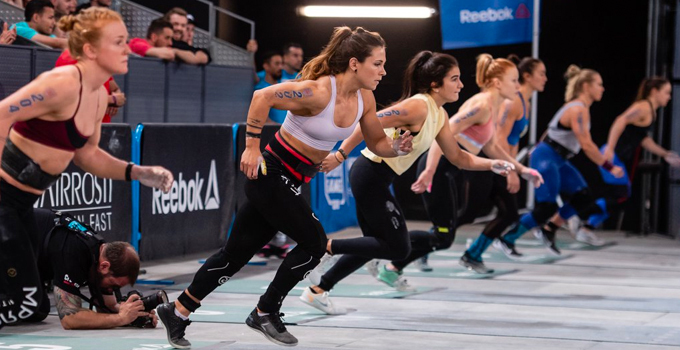 Lauren Fisher also joins Rasmus at the 2018 CrossFit Games. Willy Georges had an impressive Event 4 win and is now the first French man to qualify for the CrossFit Games as an individual. It was a tale of success and a historic comeback story was alive and well for Stephanie Chung after she turned it around on Day 2 and went on to win Event 5. And it was CrossFit Riviera that took the top spot on the podium in the team competition. Unfortunately in light of recent testing CrossFit Riviera will not be competing at the Games this year, which is unassociated with a drug violation, but due to violating team eligibility rules. This means that CrossFit PBM Unite will take their qualifying spot to the 2018 CrossFit Games now that CrossFit Riviera has been disqualified from the Games. Also, in light of recent drug testing CrossFit Valley Road will not be competing at the Games this year due to disqualification for Dean Shaw being in breach of the CrossFit drug policy. This means CrossFit Galileo will take the last qualifying spot to the 2018 CrossFit Games now that CrossFit Valley Road has been disqualified from the Games.